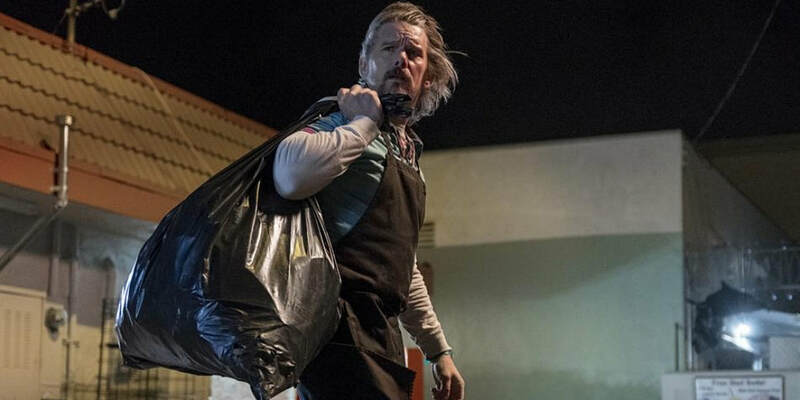 THE STORY - After being released from prison following a twenty year sentence for a minor offense, an ex-con must learn to navigate the modern world while coming to terms with his own life which has moved on - all while caring for the abandoned baby he finds in a dumpster. THE GOOD - Ethan Hawke’s tender & devastating performance. Logan Marshall-Green’s directorial debut, "Adopt A Highway," is an empathetic look at the life of an ex-con newly liberated after a twenty-five-year sentence. While the story is well-intentioned and boasts a beautiful and tender performance by Ethan Hawke, there is something naggingly unfocused and occasionally off-putting about Marshall-Green’s attempt to destigmatize individuals that have faced similarly disproportionate consequences at the hands of a fraught American legal system. Russell Millings (Hawke) is practically thrown onto the streets after his final day in prison. A smart sequence demonstrating the rapid “check-out” procedures that a prisoner must undergo in his final hours under state supervision conveys the rattling impact that such sudden changes must have on the minds of people that have known nothing else for so long. A perfunctory montage of newspaper clippings reveals that Millings was thrown in jail as a young man, a victim of California’s villainous three strikes law that imposed similar sanctions on people found in possession of marijuana as that of rapists and murderers. There is something refreshing about this counter-narrative to the idea that the imprisoned rushes out into broad daylight, free and fully empowered. By contrast, Hawke is frazzled and vulnerable upon his release, and wildly out of touch with the technological innovations now ingrained in everyday life. Eventually, Millings settles into a dishwashing job at a local burger joint and discovers through the internet cafe across the street that his parents are both dead. The man’s got nobody, though those around him recognize that although he might have a criminal background, Millings is a hard worker, strangely naive and innocent. One night as he’s closing up shop, he hears a baby crying from inside the back dumpster. Logan-Marshall douses this scene in stimuli -- the winds are howling melodramatically and Jason Isbell’s score completely envelops the moment. I understand how this scene was meant to function as one of the film’s highest emotional crests, but the whole thing felt overwrought and ultimately a little silly. Millings naturally saves the baby girl, Emma (according to a handwritten note inside the bag in which she was found), and takes her to his hotel room. Instead of calling 9-1-1, Millings reckons he might find salvation by playing father to the abandoned child. And so begins our friendly ex-con’s undoing, which will take him to unexpected places where he’ll meet a few unexpected people. As a journey of self-discovery, "Adopt A Highway" is inoffensive, though Marshall-Green’s approach belongs to a strain of unchallenging and vanilla Hollywood titles that seek to incur sympathies for the wrongfully maligned members of our society through the most basic means possible. Making your character kind, loving, dopey, white, and innocent of any real wrongdoing hardly challenges preconceptions, instead, it reaffirms the idea of an exceptional minority of innocents who by mere chance were unlucky to get caught. The harsh reality is that California’s three strikes rule was fundamentally racist, with almost half of those sentenced under this old law being black men. Do we really need a magical portrayal of a kindred white spirit paradoxically caught in the crosshairs of a wretched system when what makes this system so precisely wretched is its systematic, not exceptional, destruction of lives? Whether we think these victims are nice people or not seems beside the point. As you might be able to tell, I am not a fan of "Adopt A Highway," though it's sure to win over some audiences thanks to its "Forrest Gump" level graciousness and its well-meaning political bent. At its best, "Adopt A Highway" focuses on its brilliant lead performance without any lacquered dramatic flourishes. Despite my antipathy for the project as a whole, Hawke delivers a heartbreaking performance, a prism of pent up emotions and pain contained within a single, steady shot on his perfectly weathered face.